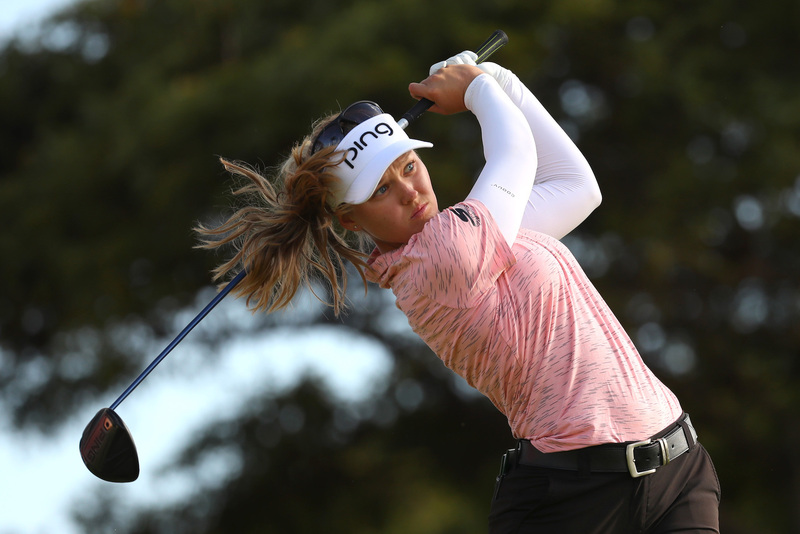 Something happens to golfers when they see a forged muscle back iron, golf’s smallest, least forgiving type of iron that only a small percentage of golfers have the talent to use effectively. 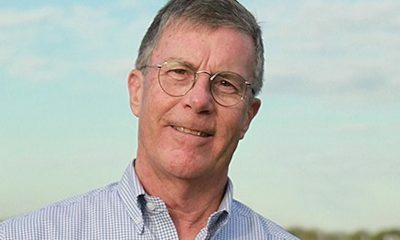 The response is similar to how motorists feel when they see an accident on the freeway. They know that shouldn’t look, that it’s potentially hazardous for them to do so, but they just can’t help themselves. 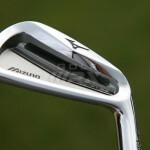 Mizuno’s new MP-4 irons will take many golfers’ intrigue with muscle back irons a step farther. 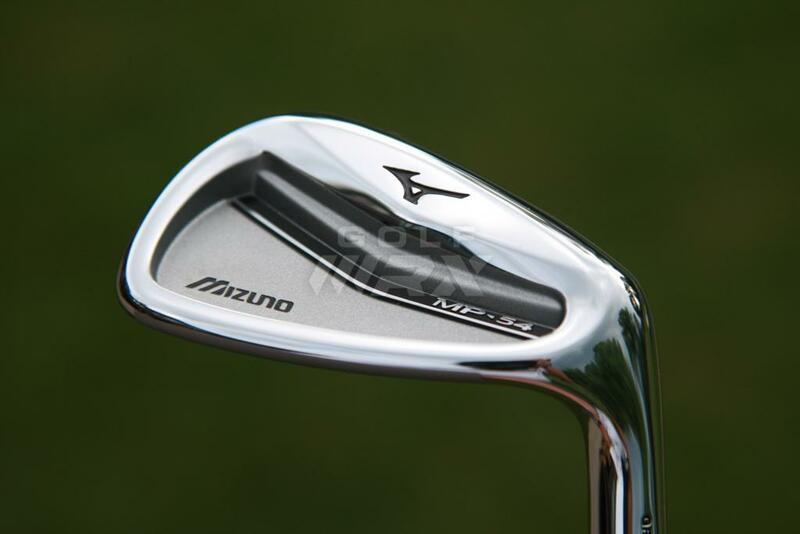 They have a classic shape and understated graphics that traditionalists will praise, and according to Chuck Couch, vice president of golf product for Mizuno, they feel as good if not better than any iron Mizuno has ever produced. 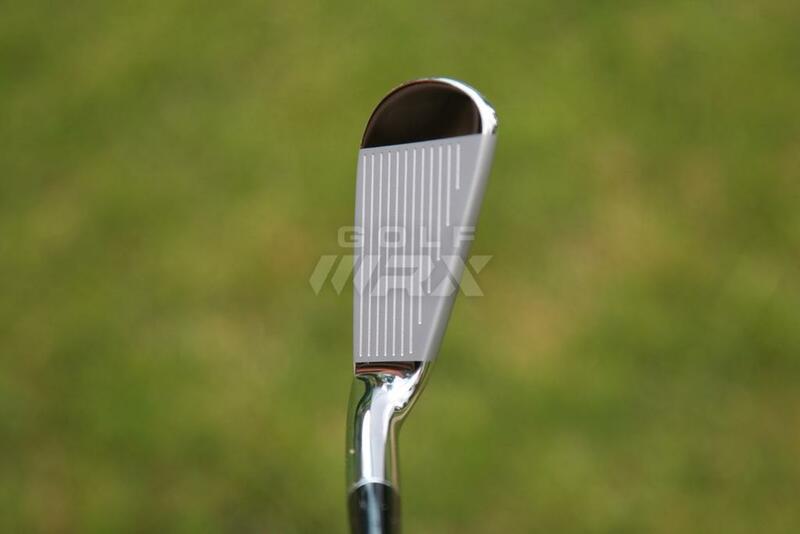 To say that a golf club has good feel sounds like a subjective statement, because good feel often means something different to different golfers. 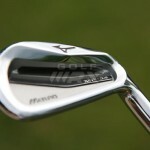 But Couch said that Mizuno has established a way to quantify feel and improve it scientifically, which is exactly what the company has done with the muscle back MP-4 irons, as well as with its new forged cavity back MP-54 irons. 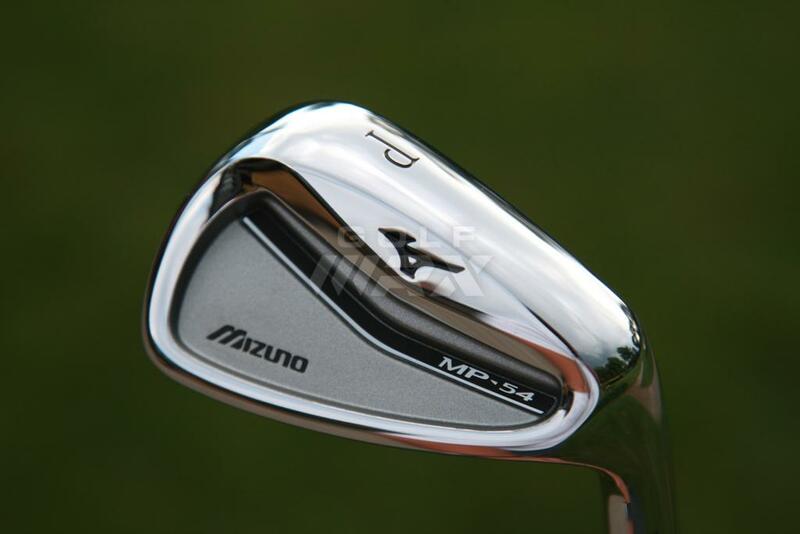 Click here to see what members are saying about the MP-4 and MP-54 irons in the forums. 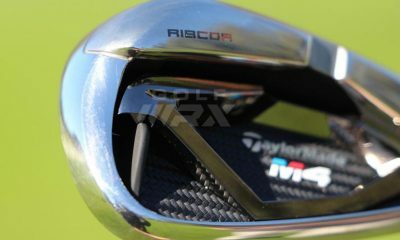 The first thing most golfers will notice about the MP-4 irons is that they look small at address, and that’s no illusion. 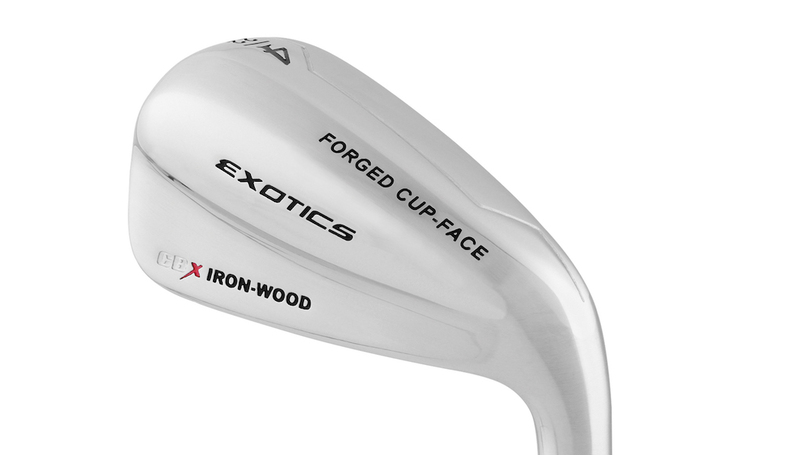 In most iron sets, the blade lengths of the irons get longer as the clubs gets shorter. 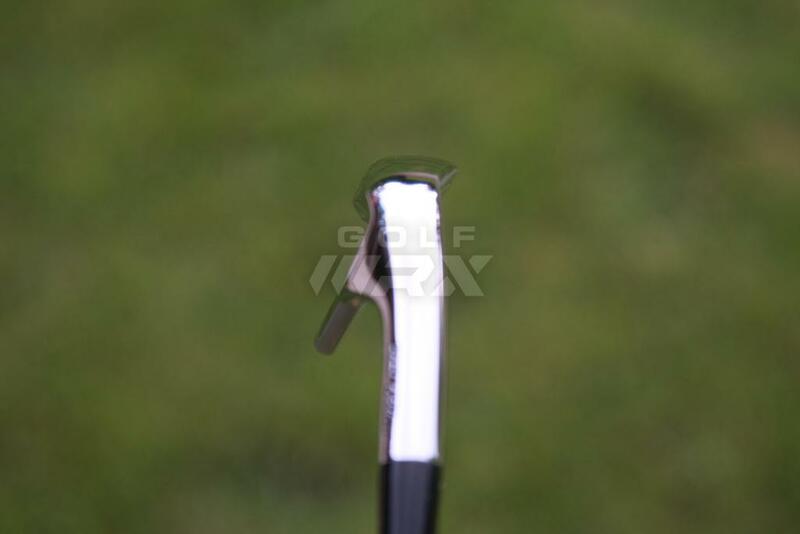 That’s because of the weight progression of the heads – short irons (which have shorter shaft lengths) have to be heavier than longer irons (which have longer shaft lengths) for the clubs to have a similar balance point, or swing weight. 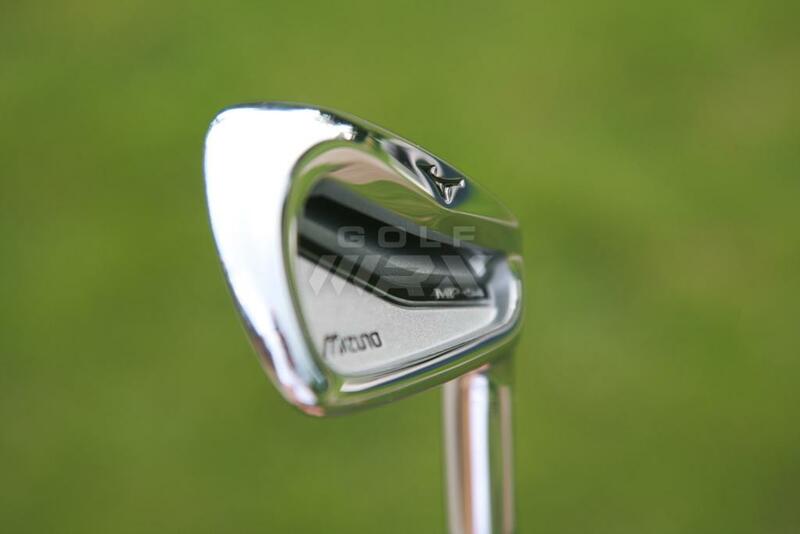 For example, Mizuno’s previous muscle back iron, the MP-69, had a blade length that grew 1.5 millimeters from the 3 iron (74.5 mm) to pitching wedge (76 mm). 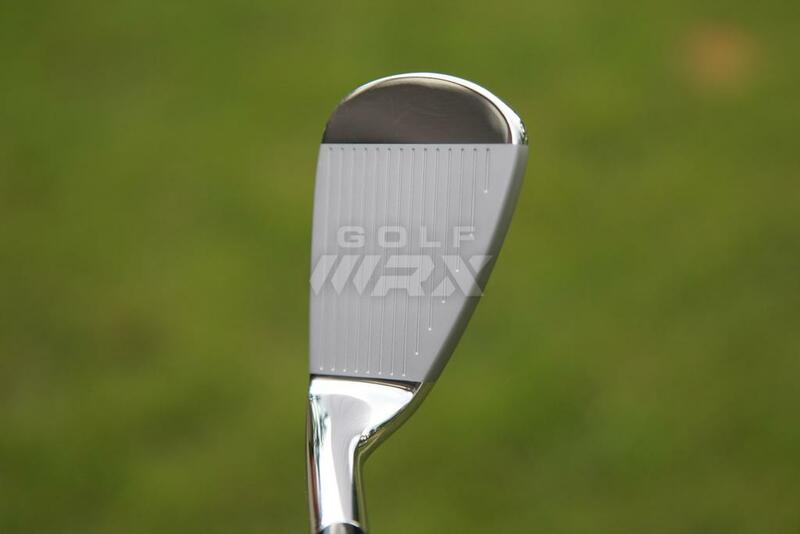 That doesn’t sound like a big difference, but for the exacting golfers who tend to play muscleback irons, it’s noticeable. 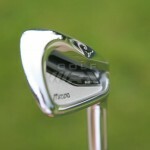 Above: The “Pure Muscle” on a Mizuno MP-4 model 7 iron. 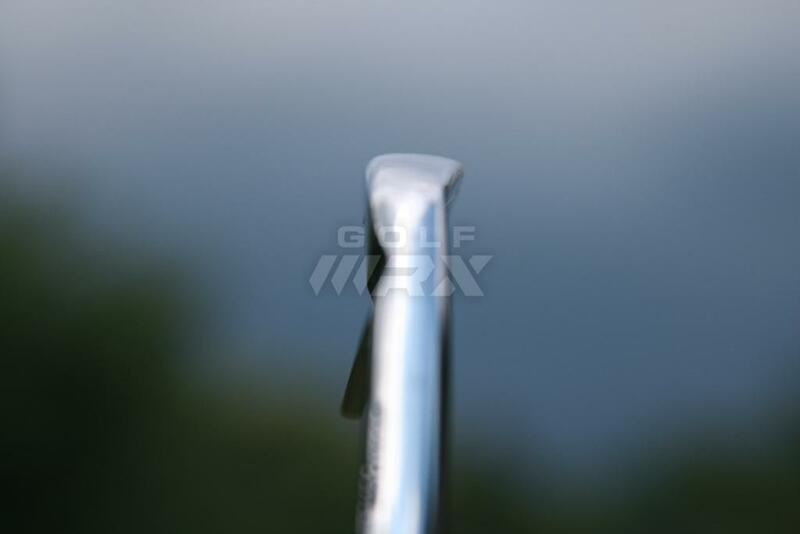 Instead of increasing blade length, engineers added weight to the MP-4 irons by increasing the size of the muscle pad behind the sweetspot of the irons, which is the reason for the irons’ pronounced bulge, or “Pure Muscle,” in the back. 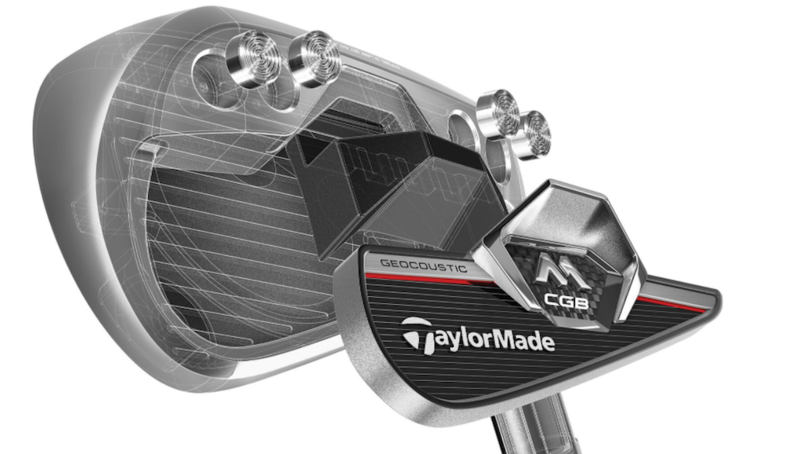 According to Couch, the added mass amplifies the MP-4’s “Harmonic Number,” the frequencies created at impact that golfers equate with feel. 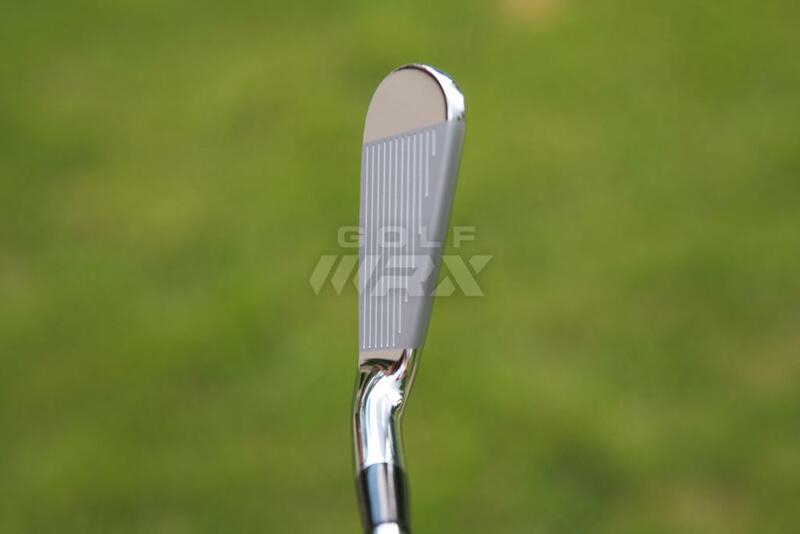 By raising the harmonic number, and tweaking the shape of the muscle pad to ensure that the frequencies have even levels, Couch said engineers can create a more pleasing sound that translates into the “sticky, soft feel” at impact that golfers rave about. If most golfers are honest with themselves, they’ll come to the conclusion that irons like the MP-4 aren’t for them. 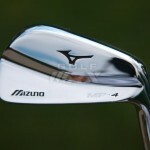 Couch speculated that not even Luke Donald, Mizuno’s highest-ranked professional golfer, will play the MP-4 irons. 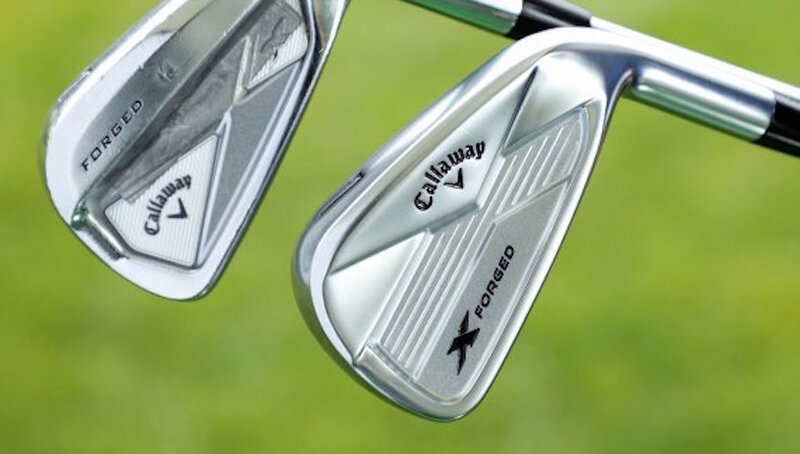 He’ll likely stick with the MP-64 irons, which are slightly larger and more forgiving (Click here to read our full review on the MP-64’s). 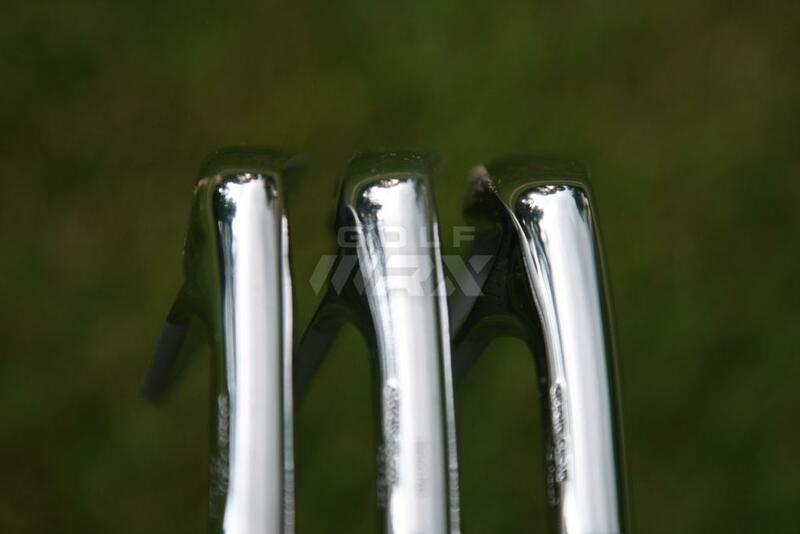 Above: Comparison photos of the MP-54 (top), MP-64 (middle) and MP-4 irons. 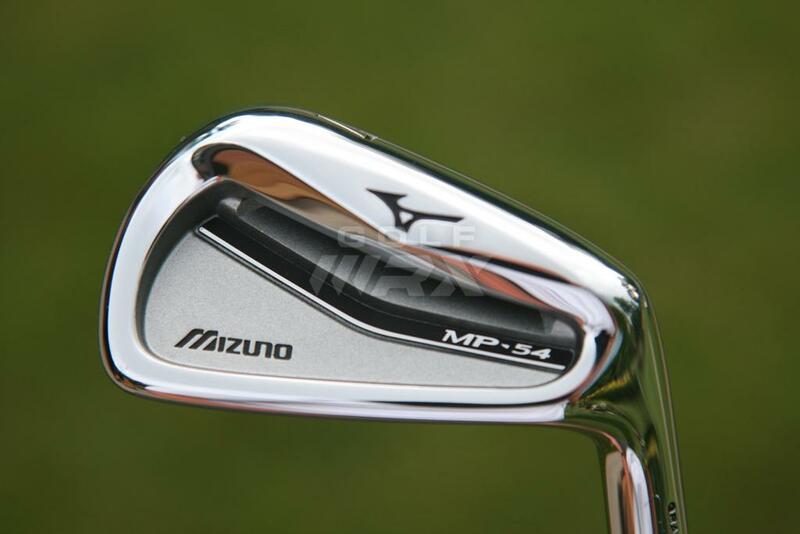 The MP-64 irons were one of our top-rated irons for 2013, but even for some of Mizuno’s staff players they’re still smaller and less forgiving than they’d like. 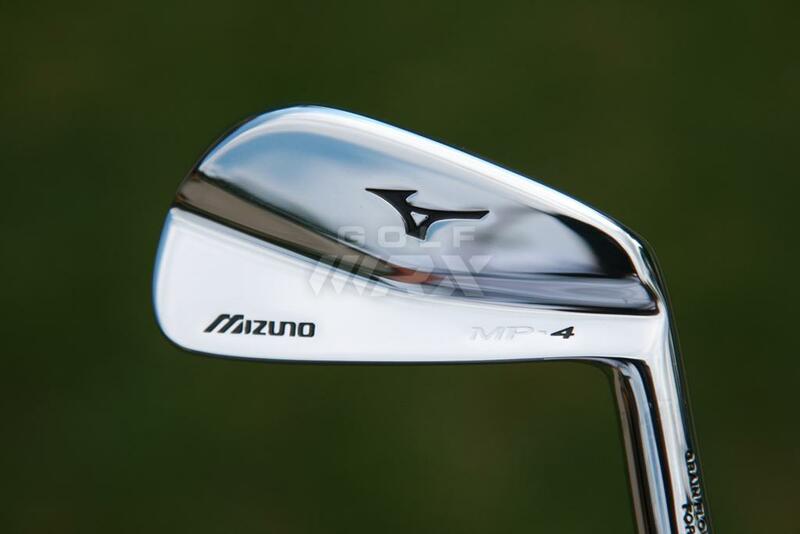 That’s why Mizuno decided to create the MP-54 irons, which like the MP-4 and MP-64 are forged from 1025E “Pure Select” Carbon Steel to help create the soft, solid feel Mizuno irons are known for. 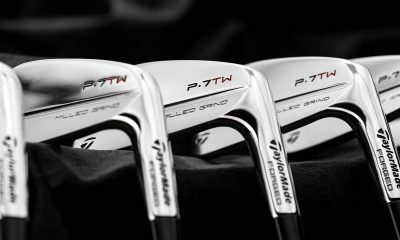 But they’re slightly larger than the MP-64’s, which Couch said allowed engineers to take total advantage of modern iron technology. 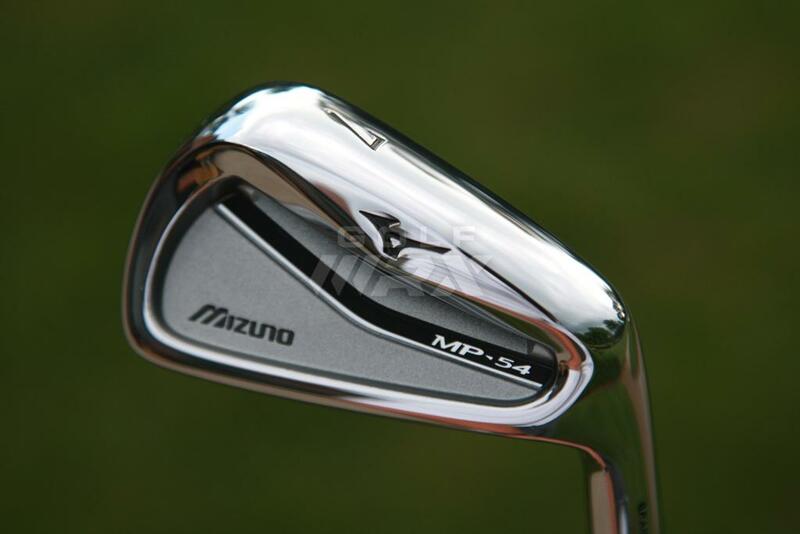 The MP-54 irons have longer blade lengths, thicker top lines, more offset and a thicker sole than the MP-64 and MP-4 irons. 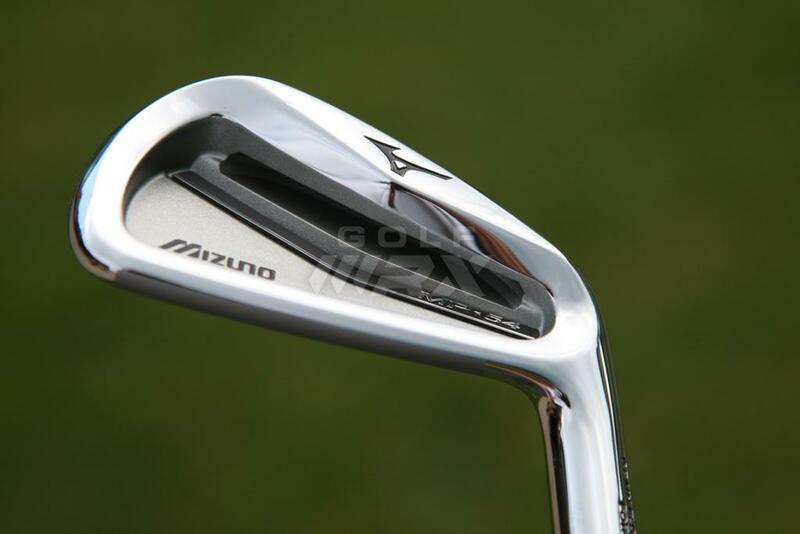 Their most important characteristic, however, is the 16 grams of weight that Mizuno removes from the cavities of the 3, 4, 5, 6 and 7 irons (see photo 1). 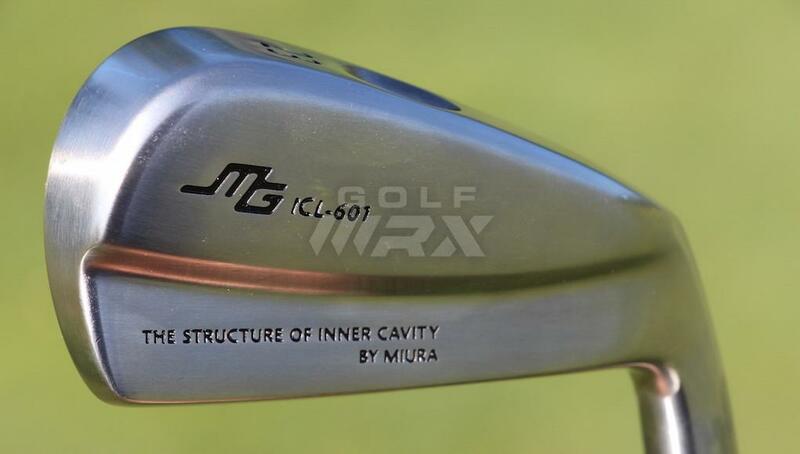 That discretionary weight was repositioned in areas that give the irons a higher peak trajectory and more forgiveness than Mizuno’s smaller-sized irons. 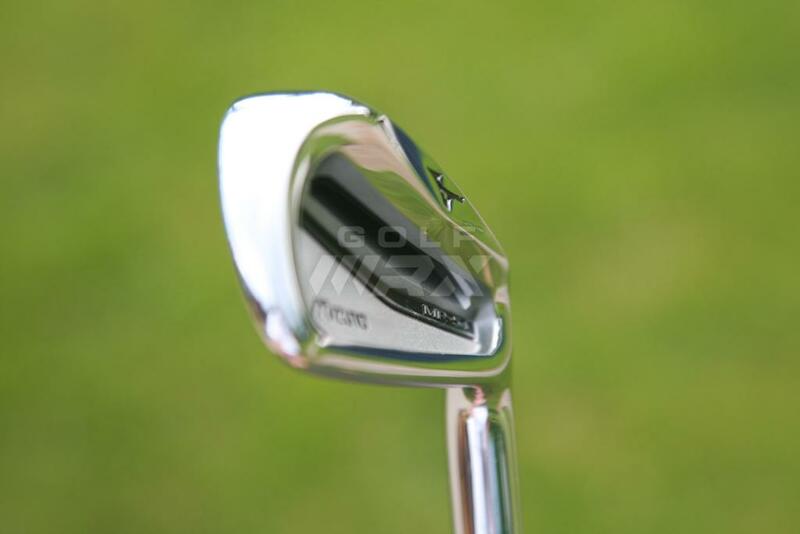 The MP-54’s 8 iron, 9 iron and pitching wedge do not have the weight removed from the cavity, however, which gives the clubs a flatter, more penetrating trajectory that better golfers prefer with their short irons (see photos 2). Couch emphasized that the “Step Muscle” design – a.k.a. 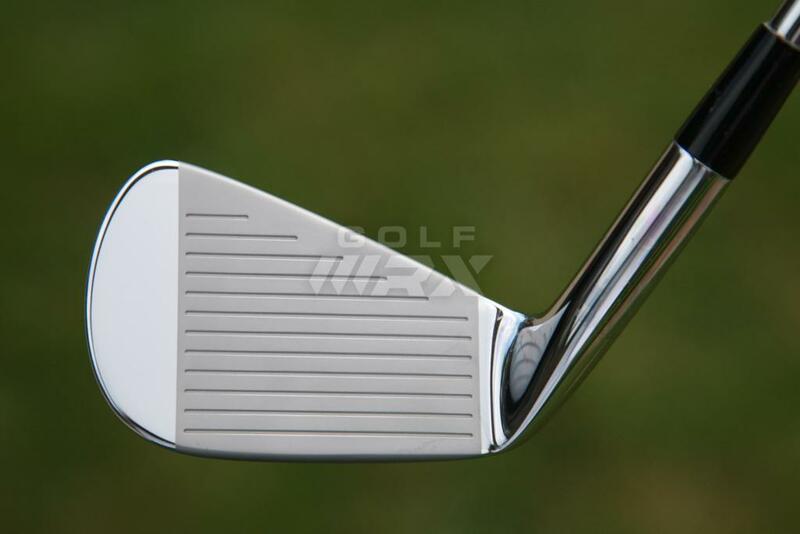 the hole that’s left in the cavity after milling out 16 grams of weight – does not compromise the feel of the irons. 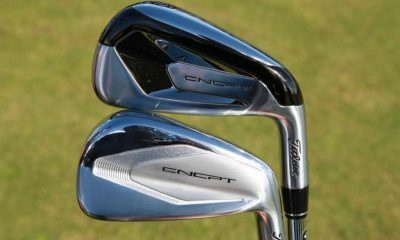 The MP-4 and MP-54 irons, which will hit shelves on Sept. 9, come stock with True Temper’s Dynamic Gold S300 shafts and will retail for $999. 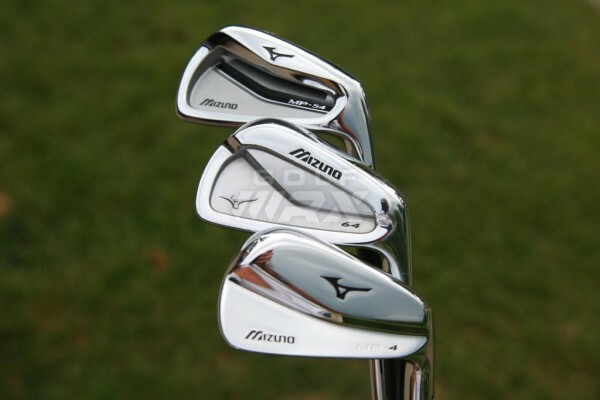 Both sets have similar lofts – the 6 irons measure 30 degrees, the pitching wedges measure 46 degrees — to allow golfers to mix and match Mizuno iron models for a combo set. Im kommenden Jahr will ich 70 Jahre feiern; spiele seit 25 Jahren und z.Zt. Hcp. 14,3. I couldn’t have said it better! What??? 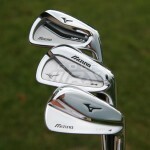 After migrating from the Titleist AP2’s to the Mizuno JPX Pro 825’s, I have now added the Mizuno MP-54’s to my bag. 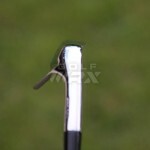 The 54’s are very high quality clubs with only one serious flaw, the exclusion of a gap wedge. 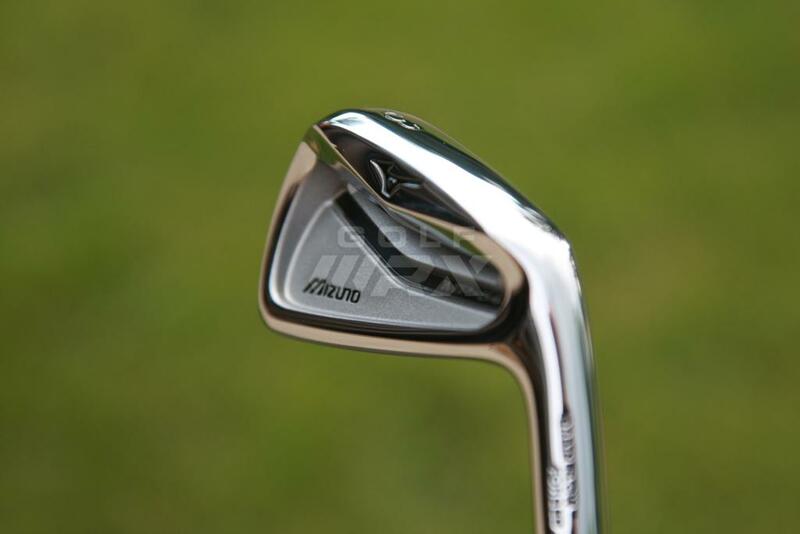 Mizuno has gone down the same road as other Iron manufacturer’s strengthening their lofts and creating a large gap between the standard PW and Sand Wedge (which most manufacturer’s have started to fill with a gap wedge around 50 degrees/the same loft as a PW from 20 years ago.) 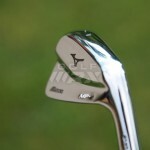 My AP2’s came with a gap as did my JPX Pros from Mizuno. 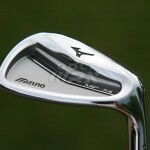 But, for some reason Mizuno has decided to not include a gap wedge in any of their MP lines. 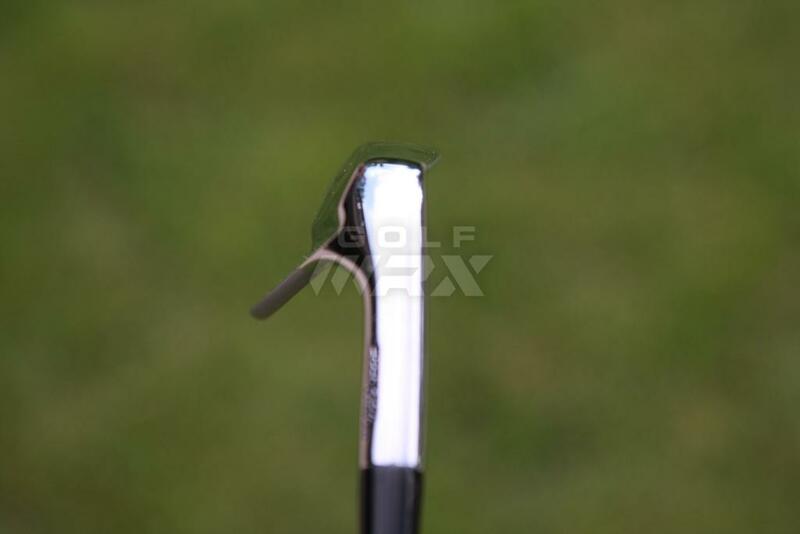 Sure, you can purchase one of their MP T4 wedges but, I can assure you from some resent testing of gap -filling wedges that it does not match the feel of the MP 54 irons. 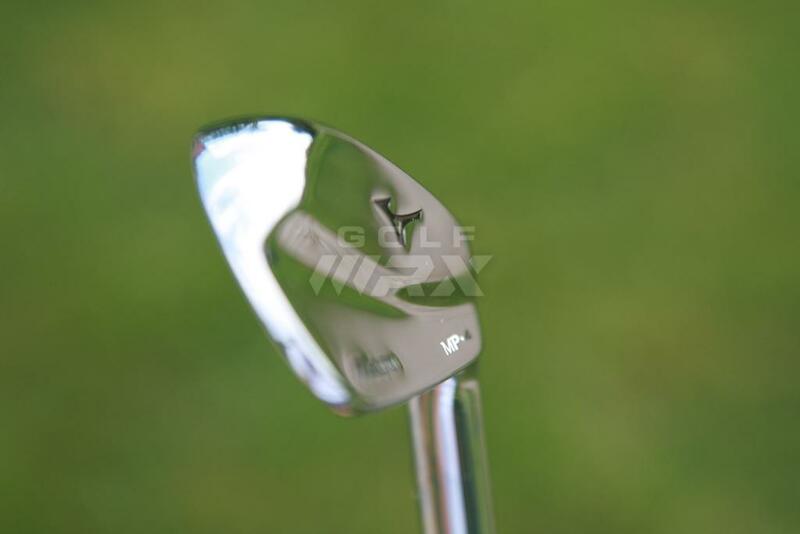 The MP T4 is a quality wedge, (every bit as good as the Tilteist Vokey) but it does not have the same feel as the MP 54’s. 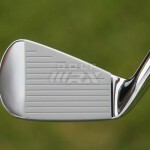 In fact after testing a dozen quality wedges with identical shafts and swingweights, the 50 degree wedge that felt the most like the MP 54 irons was the Scor 4161 V-Sole. 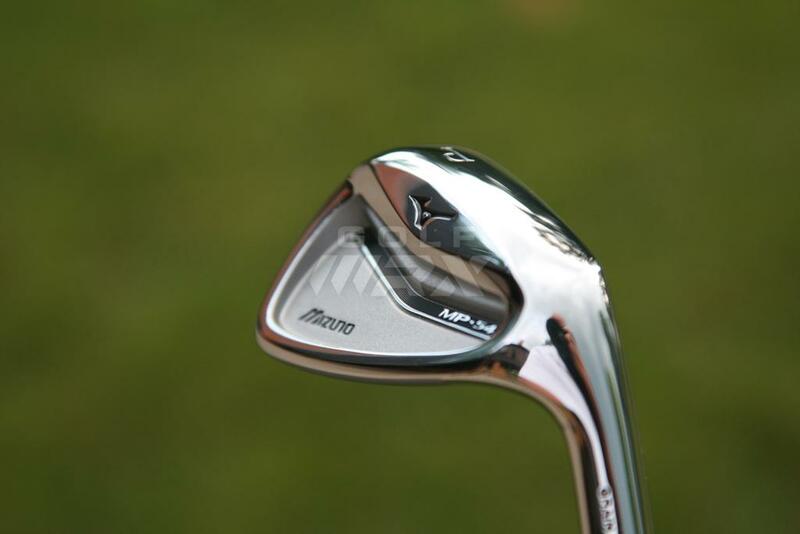 Mizuno should get smart and be conscious of this issue because they are providing a dis-service to their customers by not producing an MP gap. 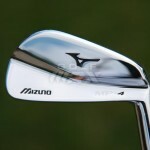 For me, until Mizuno makes this right, the Scor wedge will fill the gap. 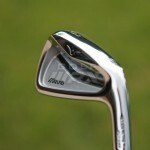 I guess I should feel lucky that there IS a gap wedge out there that DOES feel like my MP-54 irons. 100% agree, it’s so sad. 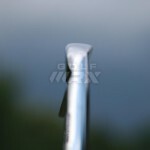 Most of the time forget about 4 or even 5 iron but a gap wedge is a must. 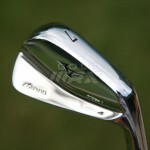 I wanted these soooo bad and then Miura introduced its new tournament blade. Anyone demo them both? 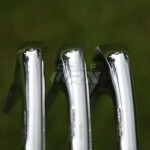 Just got a set of MP-4’s PX5.5 shafts at the weekend and had the best ball striking round I have ever had. 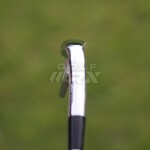 Struck the ball like a dream even in reasonable winds and apart from a couple of pulls (due to the muppet on the end of the stick) hit all the greens in reg. 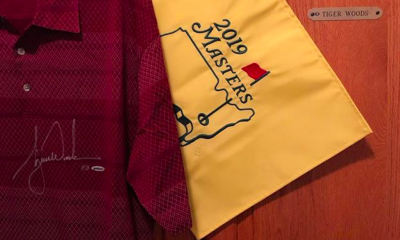 … now if only i could putt! Mine are in the mail. Mp4s. Can’t wait. 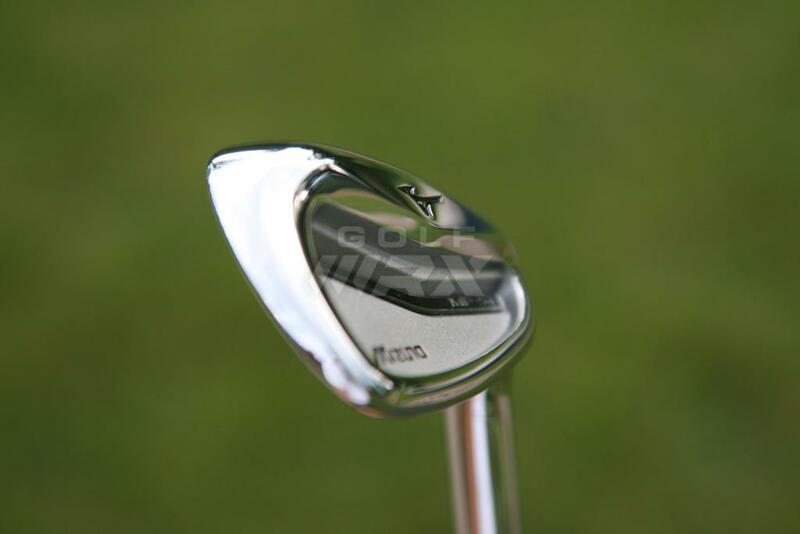 Been playing MP-62s with hard stepped s-300 for 5 seasons, USGA HI=5.8; but am getting older(58) and somewhat slower swing speed. Tried the 714 AP2 6I, MP-64s, and the MP-54s. 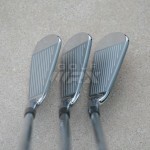 My pro set up 3 clubs for me, 4 iron, 7 iron, & PW in the 54s and have played 36 holes with them. 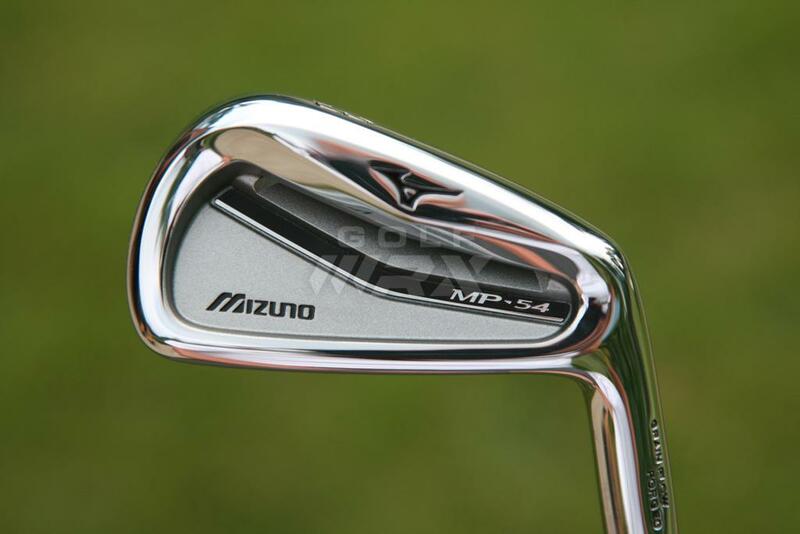 Have to say the MP-54s feel better than my 62s and almost as great as the 64s, hard to discern a difference. SWEET feel! 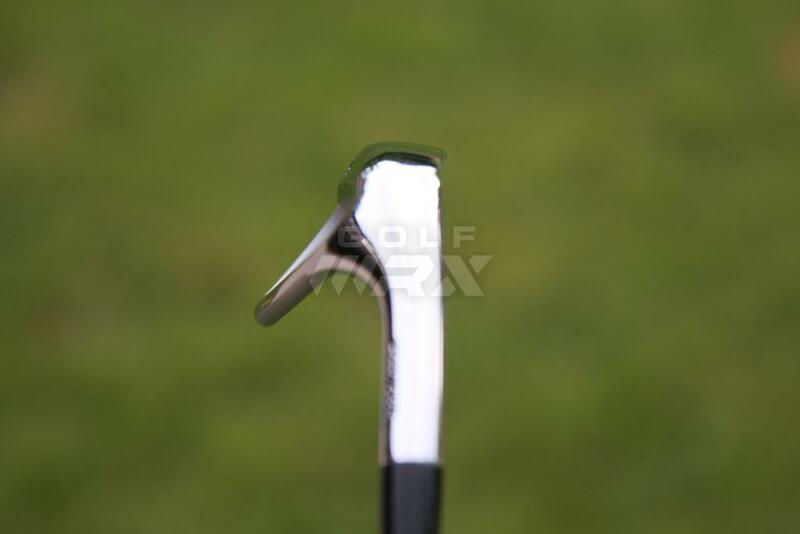 Of course hit the ball a bit higher, are more forgiving on off-center hits, but I can still feel where ball hits on the club face. 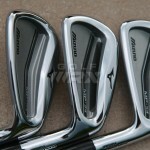 At address, you cannot tell they are game improvement, unlike the AP2 which has too stout a top line. 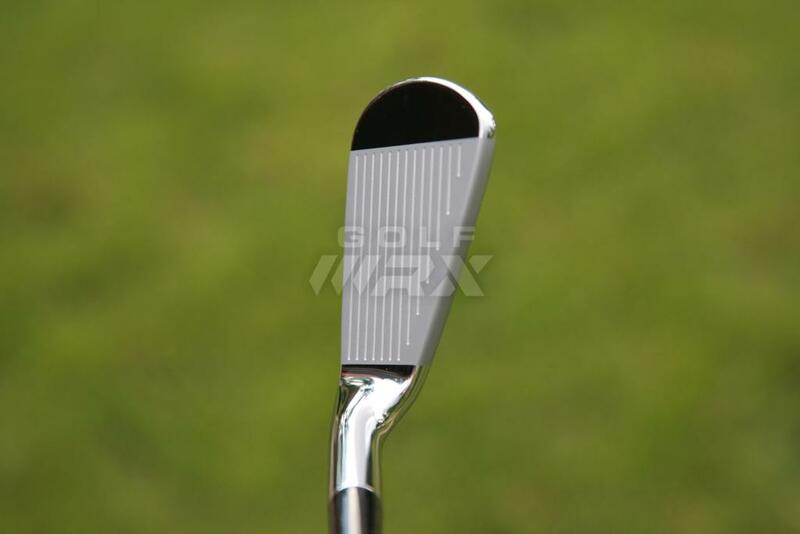 Can knock a PW down lower, but not as low as the 62s or 64s. 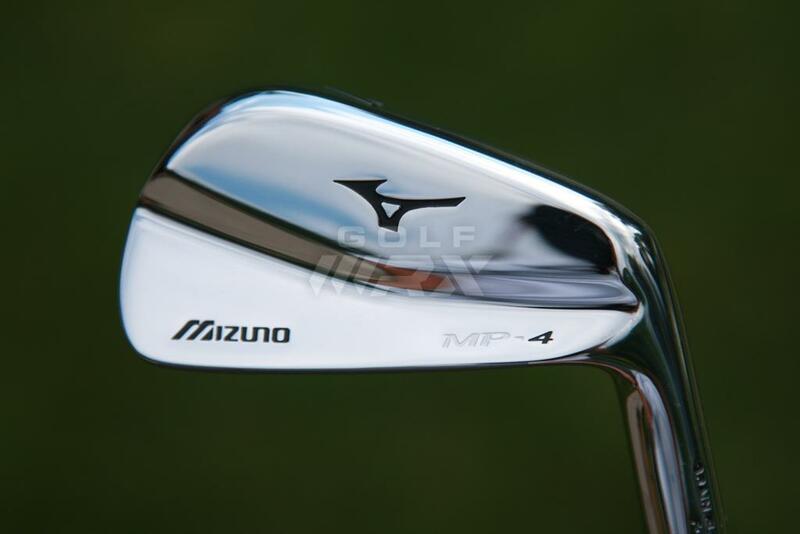 For someone looking for a little forgiveness without loss of feel, MP-54s are a great choice. 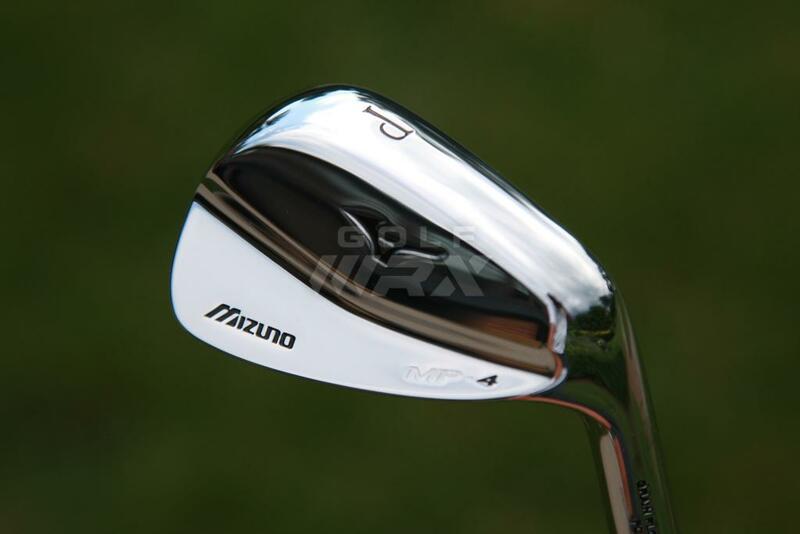 Will you be making the MP-4 for the left handed golfer? As of now it is not available . 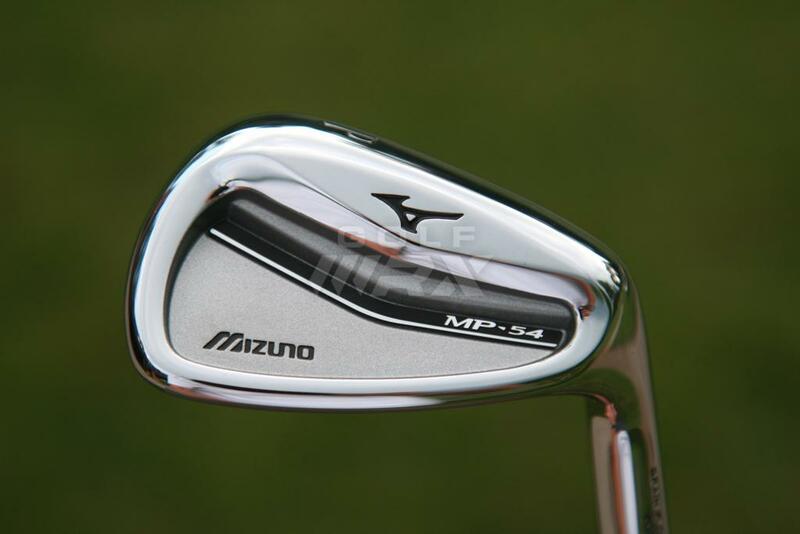 Are the MP-54’s longer heel to toe than the MP-64’s? Anyone know where there might be some side-by-side pics? Woops! I see the comparison pics above. any idea if they will be offered in L/H!? Yes. I am a lefty and hit the MP54 at the range today (6 iron). My index is 8.4 at the moment. 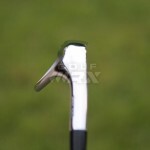 Pretty solid with my ball striking. Misses are usually towards the toe. REALLY liked the 54. 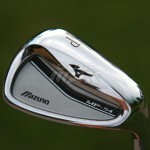 I hit it better than the 53 and AP2, which I have tested in the past. It felt more solid and forgiving to me. 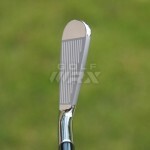 To me the head looked more substantial than the AP2 and inspired confidence. 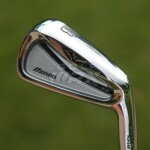 I am currently gaming R11 irons. 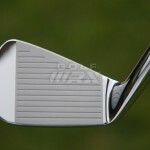 The 54s are defintiely smaller and slimmer but not radically different so it wouldn’t be a major transition to change. 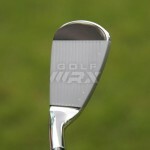 I hit the 54 straighter and a touch lower than my R11s and maybe 5 yards shorter (due to the difference in loft). 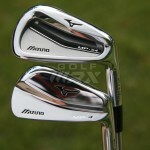 **Before buying R11 irons last year I tested the MP53s and AP2 712s but hit the R11s better so went in that direction. 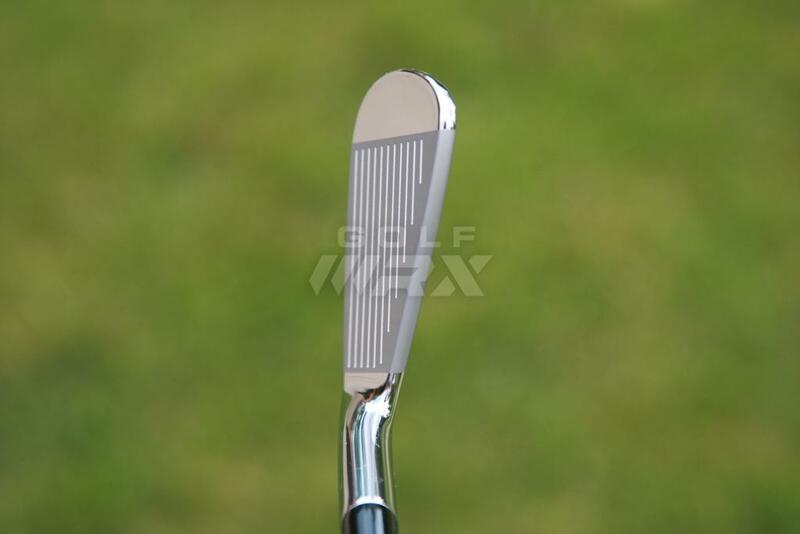 Would a 20hcp with good ball striking be able to play the MP-54 reasonably well? 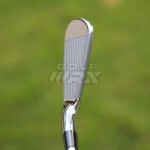 why not jpx-825 pro? 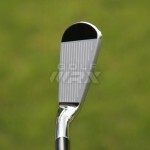 they offer good playability and feel also. 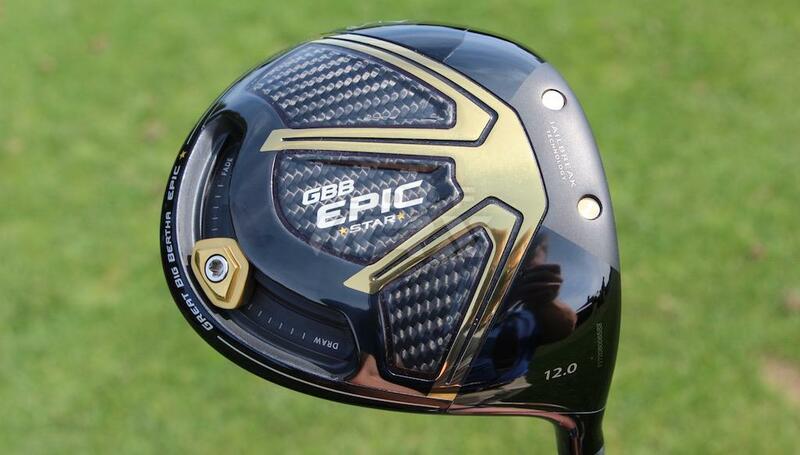 Some people want sleek looking sticks to play with, not a fisher price look with all the stickers and graphics. 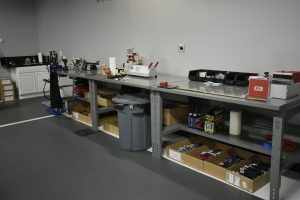 Test them out. 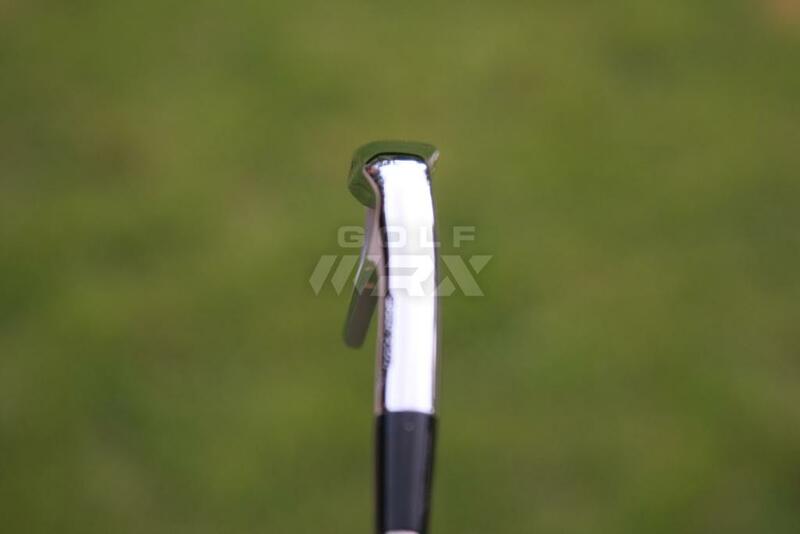 Most people have a hard time around the green which greatly affects their hc. 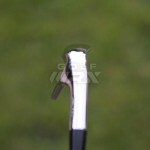 No offense but there is no such thing as a 20 hcp with good ball striking. 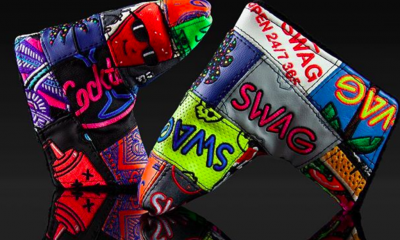 I don’t care if you take 40 putts a round, you’d still be below 15 with good ball striking. 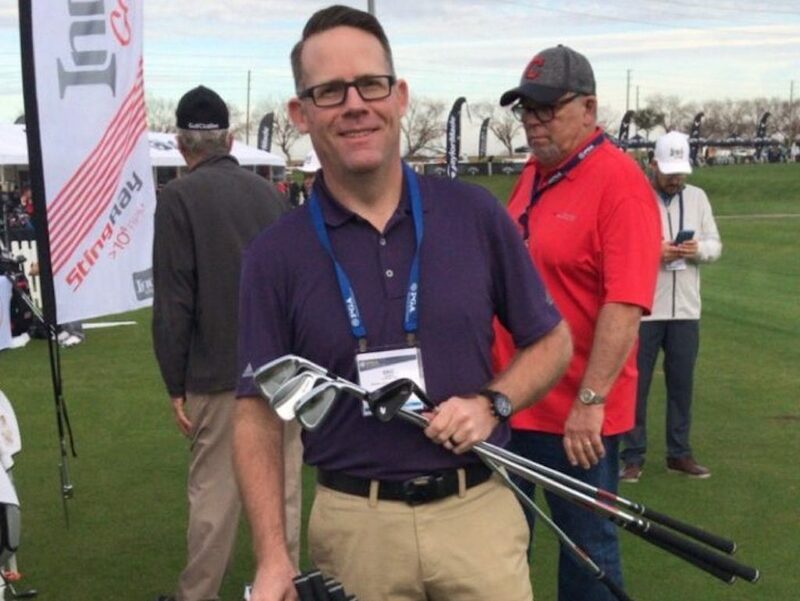 The answer is: if you are the kind of person that believes in yourself you are allowed to play the 54’s as a 20 handicap and they will help you achieve your potential as a golferr. 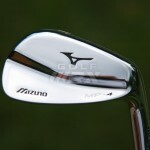 If you’re not that kind of person, you should play the jpx or some other GI club. Good comment, Larry. 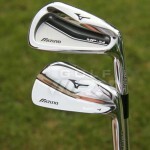 I’ve been playing the JPX 825s since they came out, and feel they’ve improved my game quite a bit. 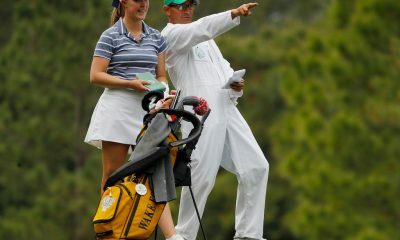 I’ve gone from a ten to a five handicap. I’m taking my new-found confidence and improved skills and am moving up to the MP-54s. Pre-ordered them last week. 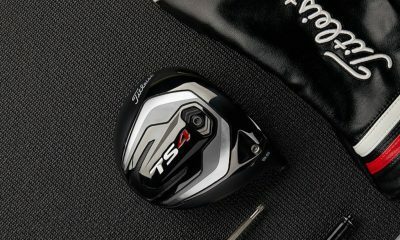 I might add that I feel that my switching from a TaylorMade RAZR Stage II driver to a Titleist D2 has also had something to do with my game improvement. 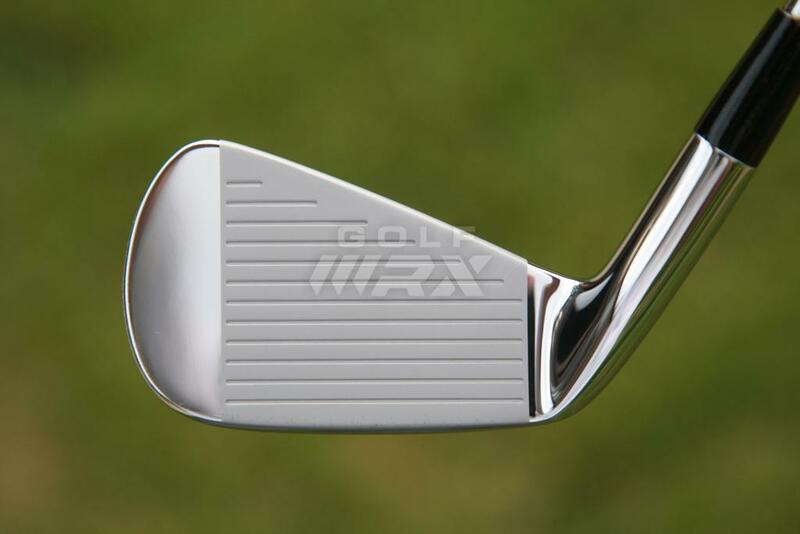 Christian – Once, when reading some club reviews, I ran across a review about the MP-69s. 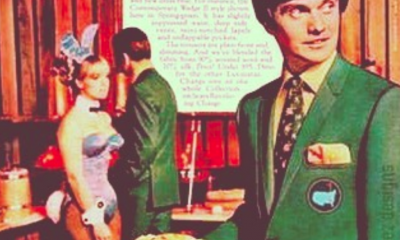 The reviewer noted that he had been using game-improvement clubs and wanted to move up. 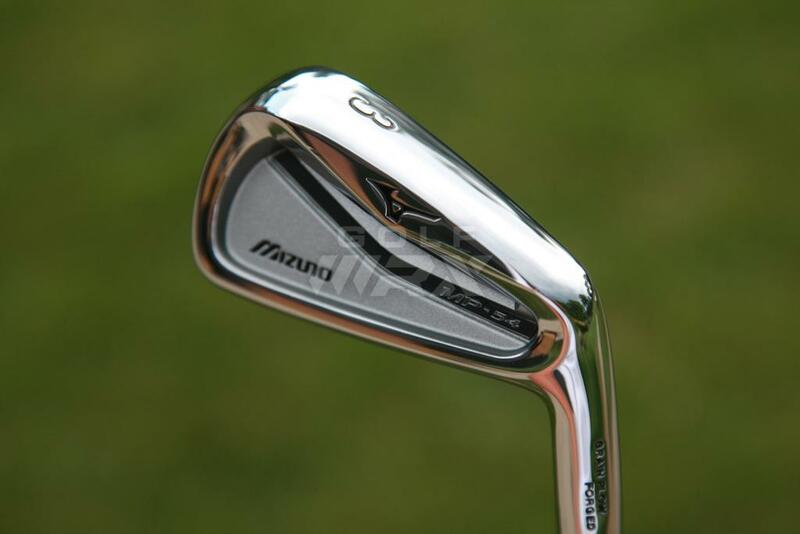 So he bought a set of 69s. 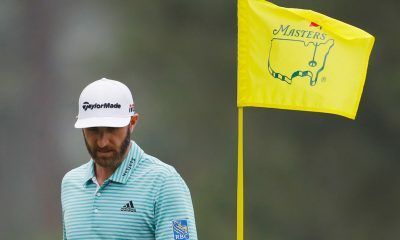 He knew the 69s would be less forgiving, but knew that if he made a bad shot, the 69s would definitely let him know. 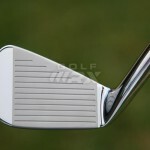 After playing with them for while, he said he eventually became a better ball striker. 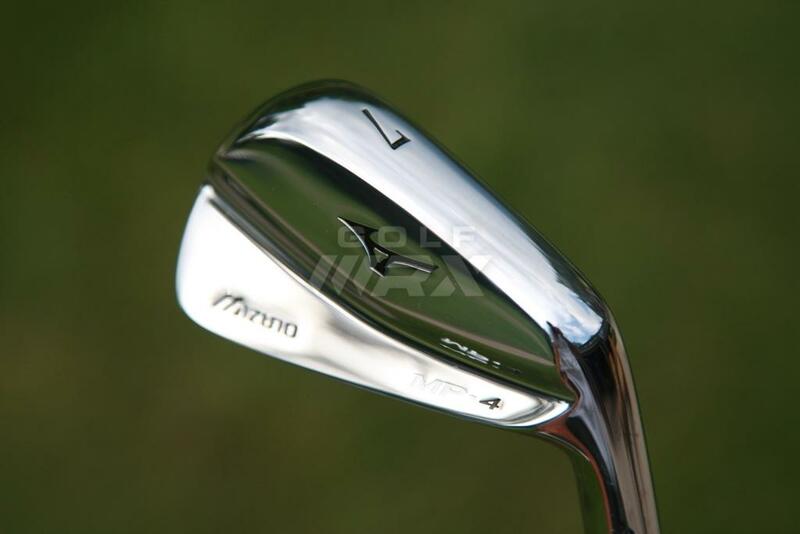 So, I would say, try the 54s – I am. I love my Mizzys. Nothing like their sound and feel. With the KBS C-tapers … beastmode. 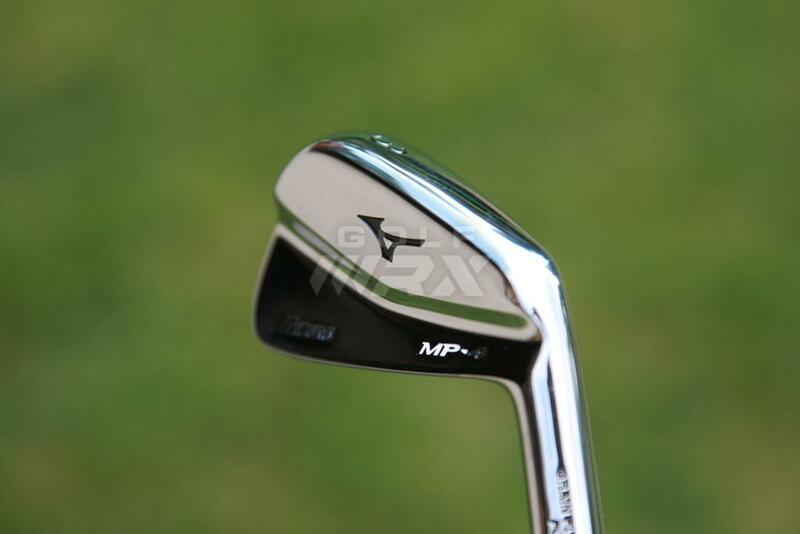 Those MP4s are probably one of the sexiest irons on the planet! If I had the cash my 690mbs would be out on their arse! 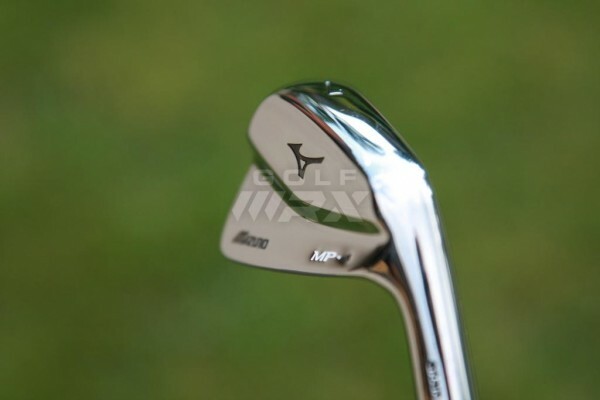 The mp-4 irons really look like a sleeker version of the old school MP-29. 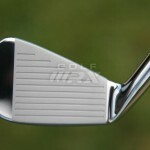 Looking at the pictures of the 3 models the grind on the mp-64 doesn’t appear to look that much more forgiving than the mp-4. 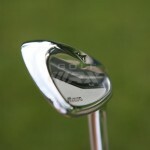 Just maybe a little longer blade length in the longer irons giving a touch more heel to toe weight. I seriously doubt any amateur would see the difference between the 2 sets as a mishit would produce similar results. 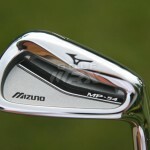 Mizuno is just offering the mp-4 to the player looking for a traditional look. Most of us weekend warriors shouldn’t look past the MP-54’s!!! I disagree. 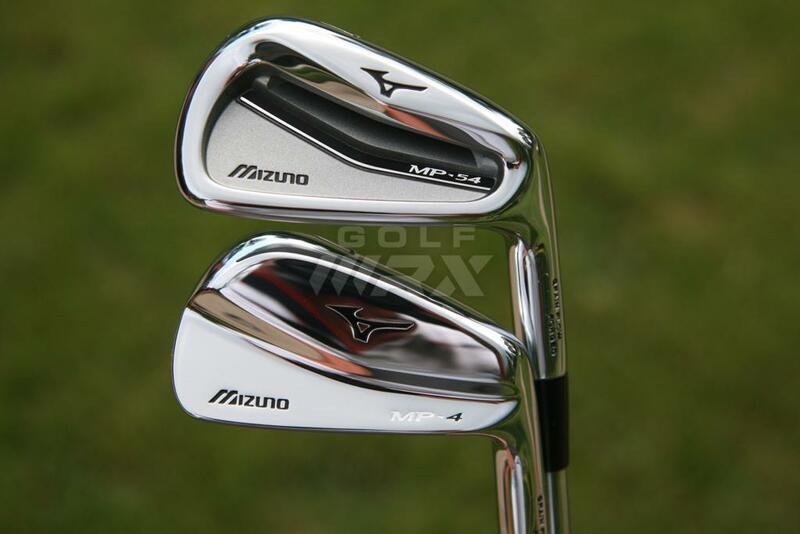 I’m amateur (4 hc) and I’ve tried MP-64 and MP-69 and they definitely feel different. 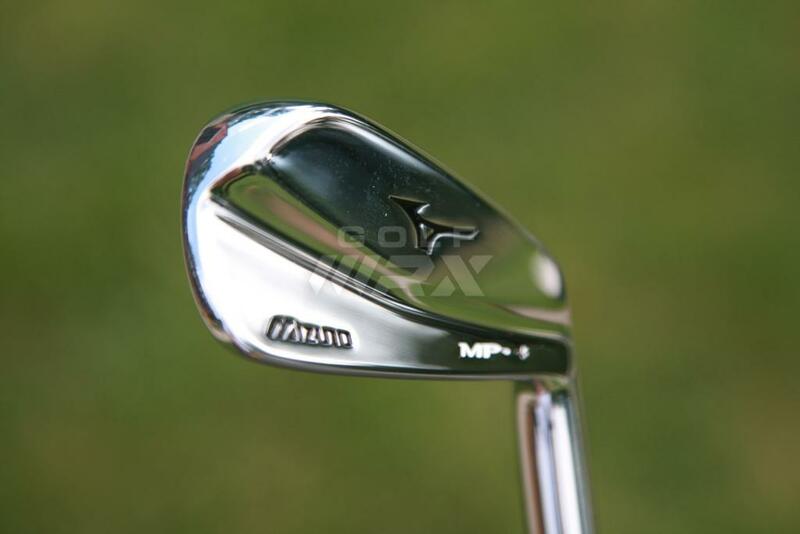 MP-64 has softer and more cushion feel compare to MP-69 which feels like a precised scalpel when you hit it right. 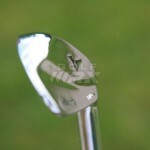 I wouldn’t play MP-69 in a tournament, but would be fun playing it in a weekend afternoon round. 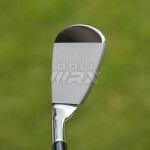 So in the 54, Mizzy saw what happened with the X Hot Pro and decided to make its own forged version. That is all. 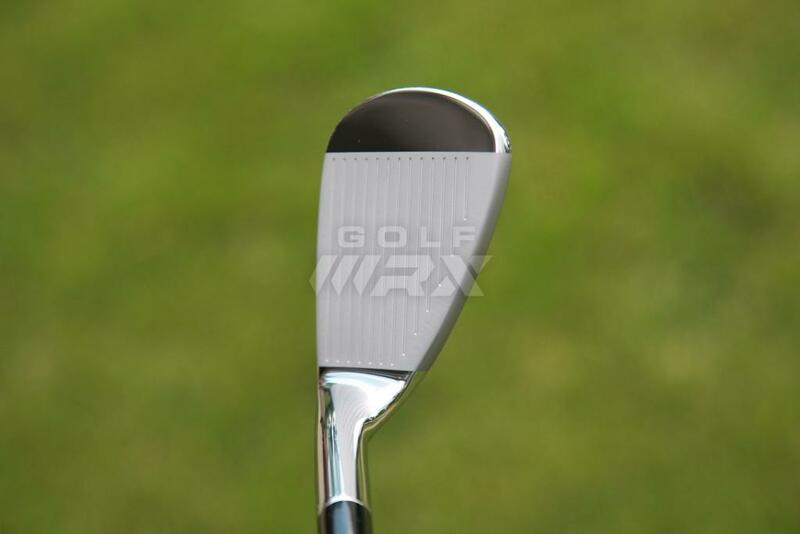 A little forgiveness is a great thing…But hitting a forged blade whether it’s the Mizzy or Wilson FG62 is like nothing else. Do I own them? 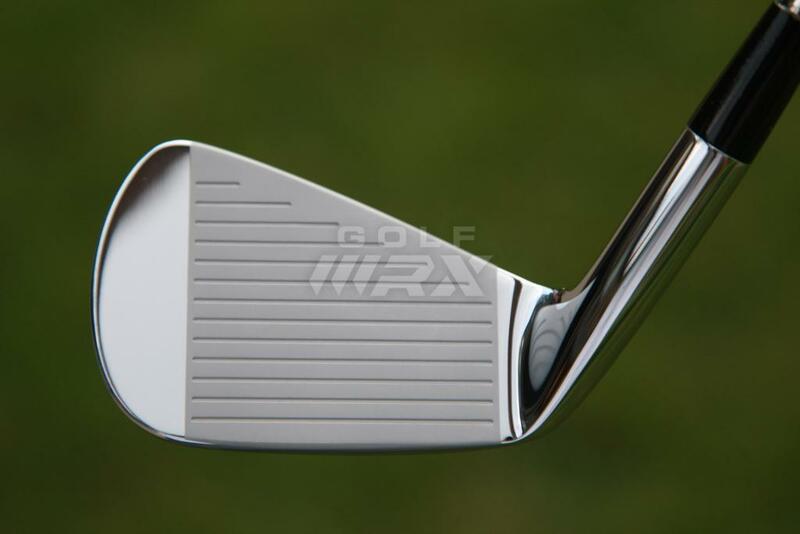 No…Been tempted to mix in the blade 8-PW to my forged cavity backs. 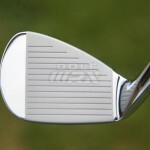 But in anything longer, I end up wishing I had a little more forgiving club. Played the Cleveland TA1 for a year but only had success when I could play and practice regularly. 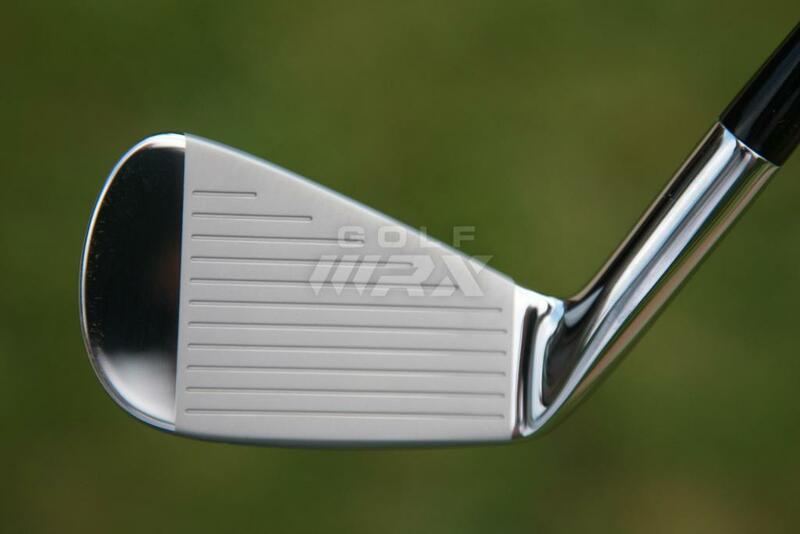 For us once a week guys, a nice forged cavity back is the best of both worlds. Lol if luke can’t play the mp-4 who can??!! 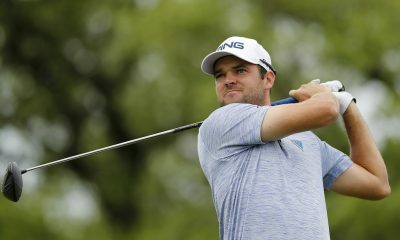 I noticed someone posted they’ll play them to stroke their ego.. please don’t its thise kind of dbags that hold everyone up hacking the ball all over the course. 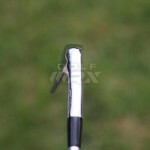 I love seeing someone trying to hit clubs they can’t and taking 13 inch divots starting 8 inches behind the ball haha. 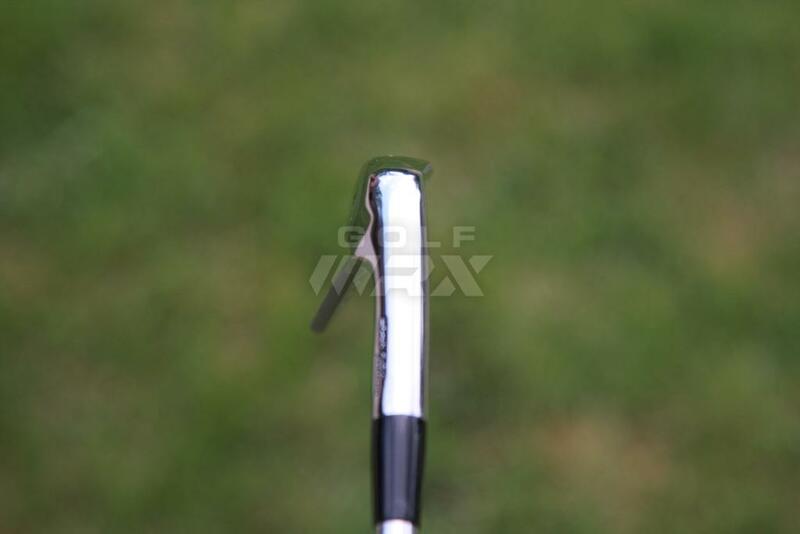 Dude, it doesn’t matter if you’re playing shovels or blades, your iron choice can’t correct hitting 8 inches behind the ball. Those people need lessons, not lectures on playing game improvement clubs. Luke can play the MP-4. He just prefers the larger face of the 64. Joe: if you’re still reading this – which ones did you get fit for? Glad to hear you like them. 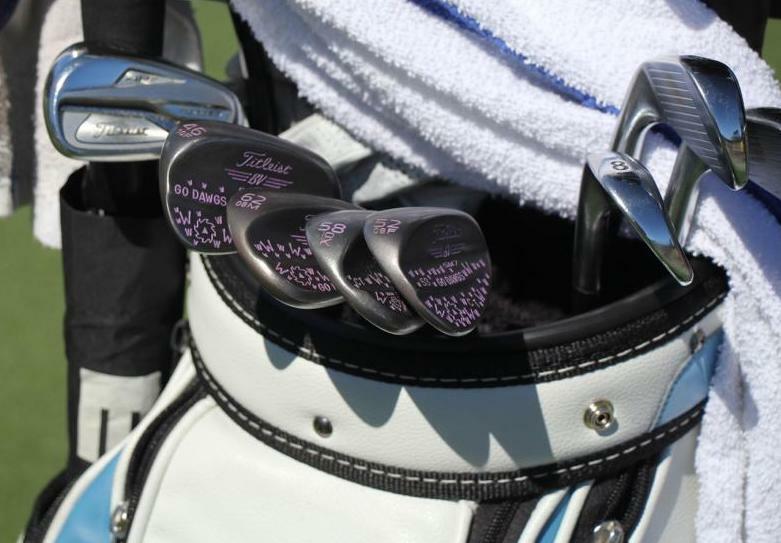 if luke donald wont hit them – one of the best iron players in the world – then why on earth would u 1. make them and 2. play them. because Luke play for money while we pay money to play, we are after enjoyment and entertainment while he is after putting bread on the table. See my reply to “Yo” above. 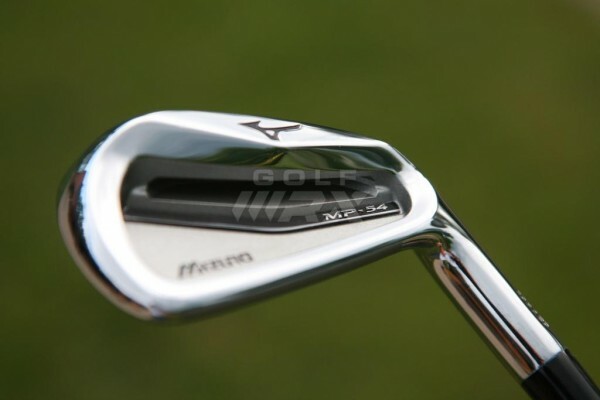 The general design of the MP-54 (semi-cavity back, milled-out low-back muscle) reminds me of the Hogan Two-piece Apex Forged irons. 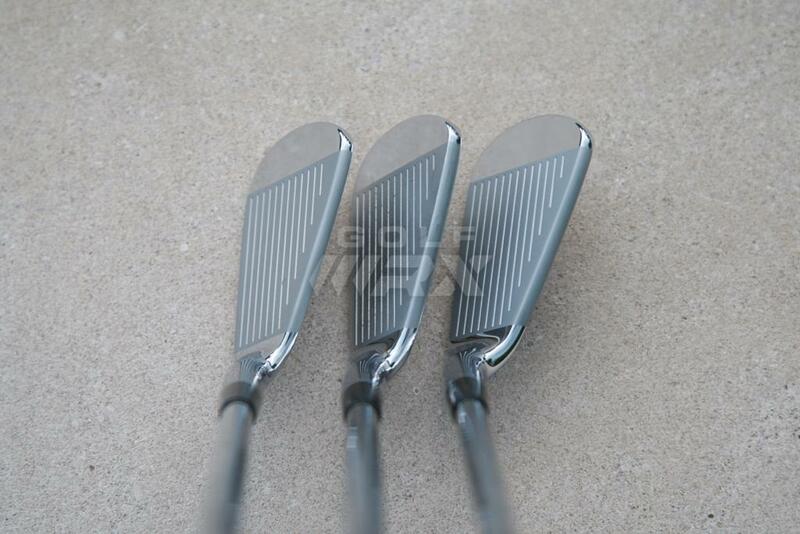 I have a NOS 5- and 6-iron which are sweet-swinging sonsaguns, and am still looking for a complete set in good nick to re-shaft with more modern sticks. My McGregor MT Pros have looked and most likely played the same since 2009. Nice rew. 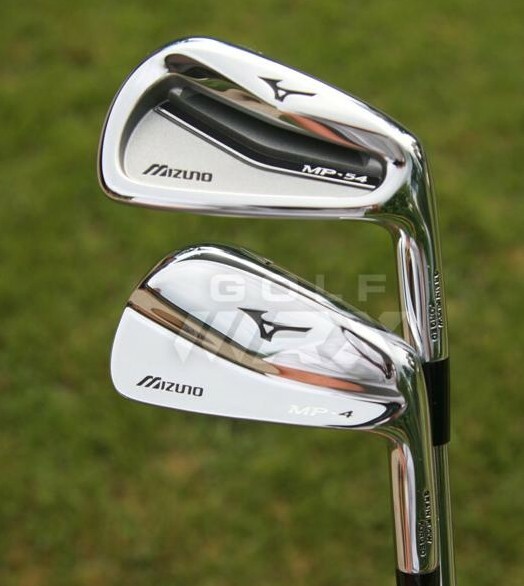 I’m a 8,3 Hcp golfer playing the MP-64s and truthfully would probably not choose the 54’s over 64’s but I’m delighted that Mizuno now has range for 10-20 handicapper as well. 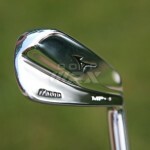 I think a 10 handicapper would struggle mightily with the MP 54 irons. 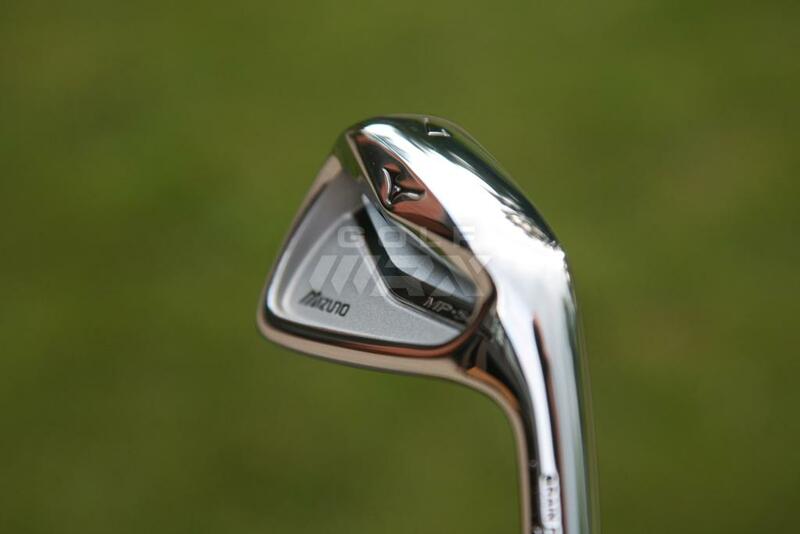 They might be okay from 6 or 7 on down, but I know how Mizunos are, feel great when struck well, feel awful when mishit, and the results of said mishit means dig out another ball. 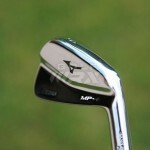 Don’t forget about the Excellent JPX irons. 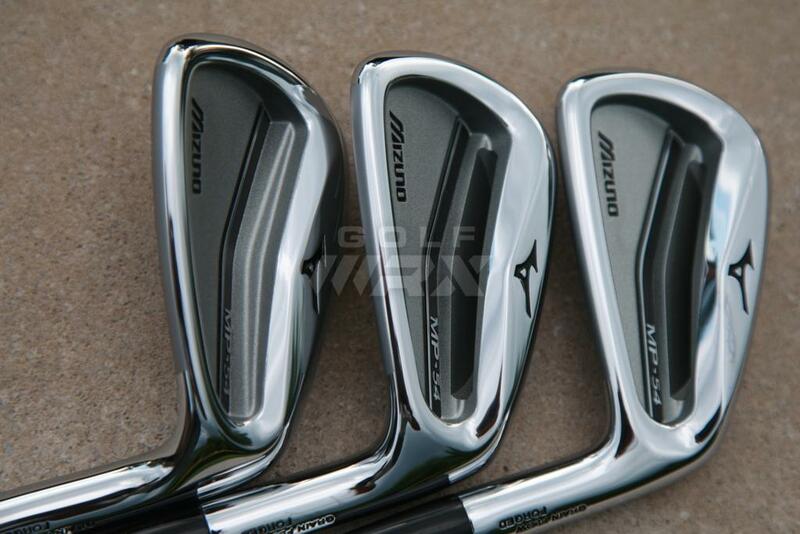 Anybody who hasn’t tested Mizuno forged is not ready to make a decision about clubs. 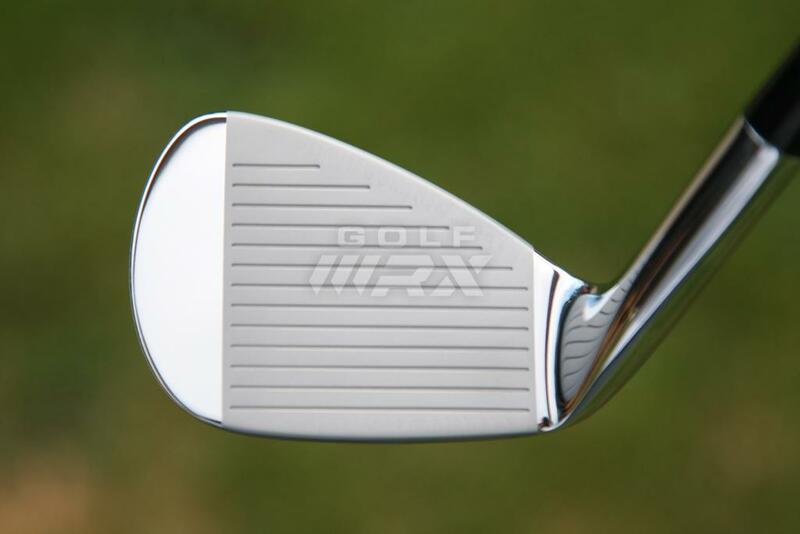 why even make a club like the mp-4 when even their sponsored tour pro won’t even play it? i guess it’s just for hackers like us. They know there are a group of morons (myself included) that will buy them to stroke there ego, haha. 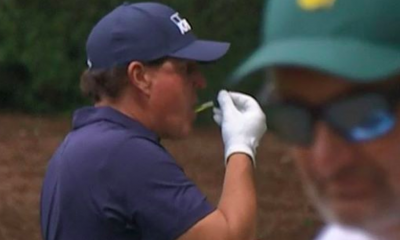 Because there is always that clubhouse “pro” drinking a beer on the 19th talking about how is MP-4 set is really helping him hit that stinging draw he’s always wanted to hit. You know the guy. 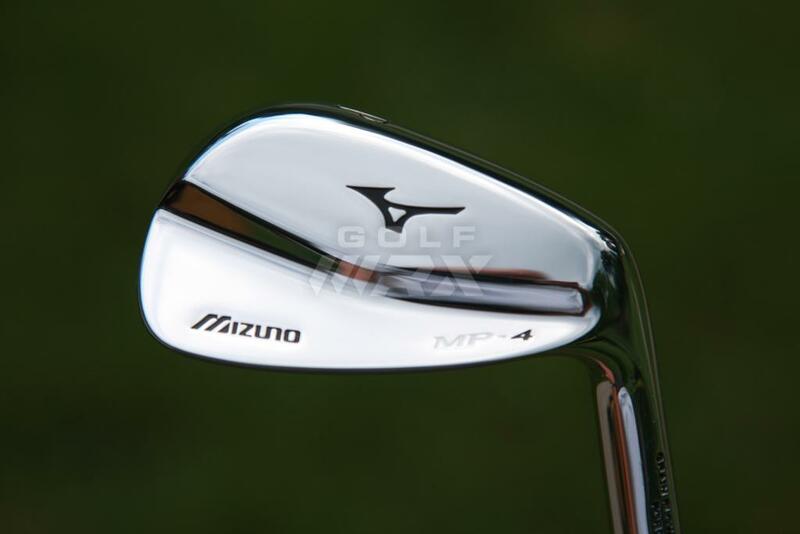 The MP-4 is plenty forgiving, but many tour pros, including Luke Donald and CH III, prefer larger club heads and thicker top lines at address. This is why they’re using the MP-64s. I understand, though, that CH III is a big fan of the MP-54s. Time will tell. 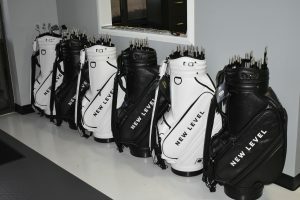 Although the new clubs won’t be available for pre-order until the first week of September, I was lucky enough to get my hands on the 4 and 54 today. 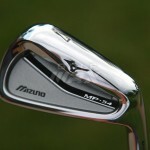 While I’m leaning toward the 54, I must admit that the MP-4 is the most beautiful iron I have ever seen. 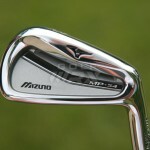 Mizuno has always made quality equipment. These 2 new offerings are no exception to that. 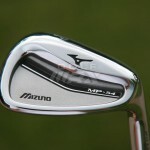 More players should consider Mizuno. 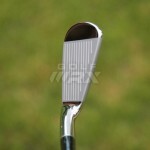 I’m on my 2nd set in last 4 years only because I gave up my 5 yr old set of MX-23 a little earlier than I should have. 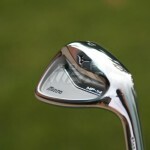 Mizuno should ALWAYS be demoed when buying new clubs. Why does it have to be CHIII? 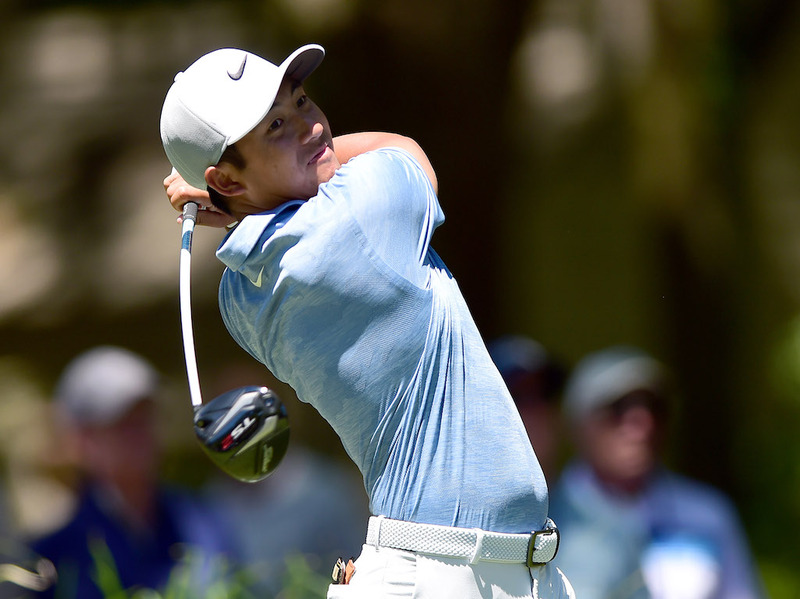 Mizuno needs to get somebody else in the top 20 of the world other than Luke to be their spokesperson. 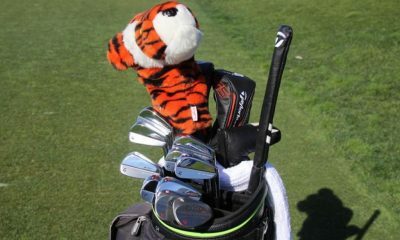 I heard a rumor that thry are talking to Keegan Bradly? 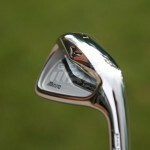 Thanks for the write up – looking for new irons soon and definitely going to give these a try. Can’t wait! You all write good and informative articles. 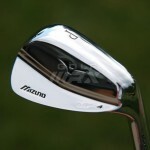 I enjoy reading the your club reviews.